Some diamonds reveal a change in color when exposed to ultraviolet light whether from the sun or from fluorescent light bulbs. This characteristic is called fluorescence. 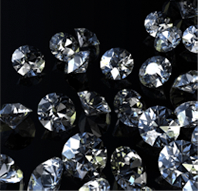 Fluorescence plays a crucial role in the pricing of diamonds. Just as diamonds that are yellowish when seen with the naked eye are lower in value than those that are clearer, diamonds with a yellow fluorescence are graded lower than diamonds without, and hence are less valuable. On the other hand, diamonds showing a blue fluorescence are considered to have a higher quality than those with yellow fluorescence because the bluish white color more closely approximates the characteristics of colorless or near colorless diamonds. Also, the degree of fluorescence in diamonds varies a great deal and those with weak fluorescence are more desirable than those with a noticeable amount. When buying diamonds, ask the jeweler for the certificate that accompanies the stone. It will disclose, among many other things, the amount of fluorescence, and that will directly impact the price. The certificate will indicate whether the diamond's fluorescence is blue, white or yellow and if the diamond fluoresces very strongly, strongly, moderately or has a weak to faint fluorescence.